L-phenylalanine is an essential amino acid crucial to maintaining your health. Essential means that your body can’t manufacture that amino acid by itself; you have to get it from foods or supplements. L-phenylalanine is a catalyst in the creation of tyrosine, which processes hormones. It also aids in the formation of neurotransmitters like dopamine, epinephrine and norepinephrine. In addition to its extensive role within the body, L-phenylalanine is an effective supplement for overall health and well-being. If you were going to build a human body from scratch, you would use proteins to do it. Proteins build, maintain, and replace muscle and body tissue. 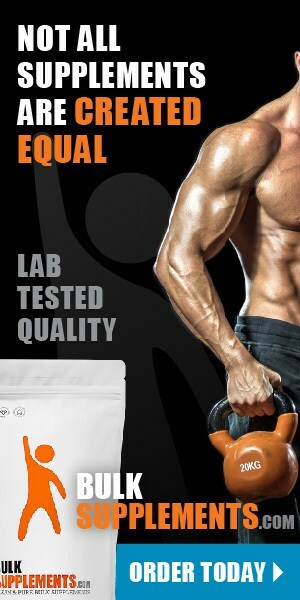 Amino acids are the chemical building blocks of those proteins. They play a large role in maintaining optimal function in every cell in your body. There are more than 50 amino acids, and nine of them–including phenylalanine–are essential. Since its discovery in 1879, phenylalanine’s role in the body has been extensively studied–it turns out that this amino acid boasts some seriously impressive benefits for overall health. When the body’s pigment-producing cells die or stop functioning, it results in a condition called vitiligo. The cause of vitiligo is a mystery, though some experts consider it an autoimmune condition. As with other autoimmune diseases, vitiligo causes the body to attack normal, healthy cells — in this case, the cells that produce skin pigment, called melanocytes. This results in the loss of color and white patches on the skin. But studies suggest combining phenylalanine with ultraviolet light therapy could help reduce vitiligo symptoms by improving skin pigmentation. Clinical research shows that patients taking 50 mg of phenylalanine per 50 pounds of body weight showed significant skin color improvement. Researchers in Spain gave patients a phenylalanine supplement combined with a skin gel and regular exposure to sunlight for 30-minute intervals. At the end of the trial, participants noted a 75 percent improvement in the appearance of their vitiligo (x). Attention-deficit/hyperactivity disorder (ADHD) is a brain disorder, often surfacing in children and continuing to manifest its symptoms into adulthood. Some inattention or hyperactivity is normal in young people, but when inattention and hyperactivity are part of an ongoing, destructive pattern that interferes with normal development, it may be due to ADHD. It is possible to treat ADHD, but there is currently no known cure. Those with ADHD typically have lower body levels of phenylalanine, meaning supplementing with phenylalanine may help relieve symptoms. Doctors often prescribe it along with medications like Ritalin or Adderall. Combining phenylalanine with traditional medications for ADHD may also help buffer symptoms of medication withdrawal (x). Step into any pharmacy and you’ll immediately find rows of medications that treat pain, but not its underlying cause–and more often than not, they come with a host of side effects. But phenylalanine could provide natural pain relief (without a mile-long list of side effects). There are two types of phenylalanine: the first comes from the foods we eat; this form is the essential amino acid l-phenylalanine. The second is produced synthetically in a lab–this form is called d-phenylalanine. Combing the two forms creates a power-packed compound called DLPA (Dextro-Levo-Phenyl-Alanine), which is used to treat chronic pain that doesn’t respond to traditional pain relievers or other natural remedies. Most painkillers require a higher dosage over time, but DLPA is the opposite–over time, you’ll need less of it to relieve pain. And since DLPA breaks down into phenylalanine, it can help boost your body’s levels of natural phenylalanine. The biochemical result? DLPA seems to assist the body’s inner system of relieving its own pain (x). Because of its role in dopamine production, phenylalanine could help relieve depression and boost mood (x). Dopamine is a type of chemical and hormone known as a neurotransmitter that helps regulate your mood. When your brain produces healthy amounts of dopamine, you feel hopeful, optimistic, and happy, but without balanced dopamine levels, you may notice symptoms like fatigue, depression, weight gain and addictive behaviors. So where does phenylalanine come into play? Here’s how it works: your body converts phenylalanine into tyrosine, another amino acid that aids in dopamine production, ensuring you get a healthy dose of “feel good” hormones daily. 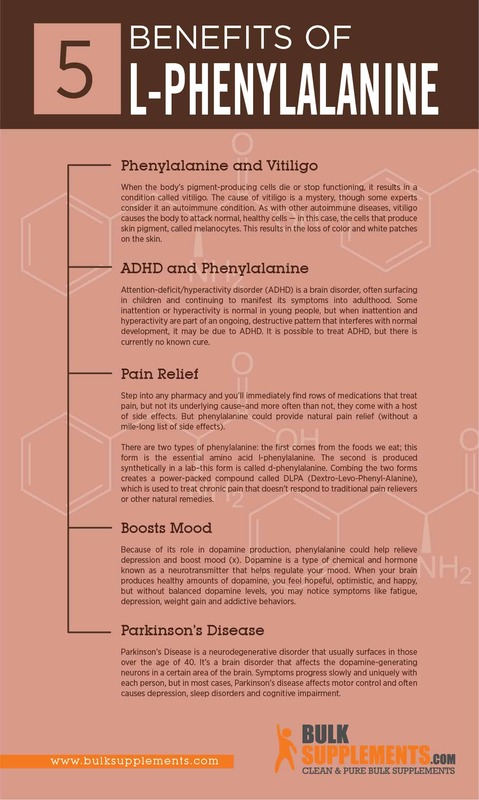 Many people supplementing with phenylalanine have reported decreased symptoms of depression. In one study, twenty patients with depression took 200 mg of phenylalanine as DLPA every day. At the end of the three-week study, twelve patients reported their depression symptoms had completely disappeared, and four patients experienced mild to moderate improvements in their mood (x). If you’re struggling with depression, always talk to your doctor before taking any medications or supplements. Parkinson’s Disease is a neurodegenerative disorder that usually surfaces in those over the age of 40. It’s a brain disorder that affects the dopamine-generating neurons in a certain area of the brain. Symptoms progress slowly and uniquely with each person, but in most cases, Parkinson’s disease affects motor control and often causes depression, sleep disorders and cognitive impairment. Studies using d-phenylalanine (the lab-created form of l-phenylalanine) have shown that it may improve tremors in people suffering from Parkinson’s (x). However, phenylalanine can interfere with another Parkinson’s medication, Levodopa, so avoid taking the two together (x). The only way to get phenylalanine is from what we take in — through food or supplements. So, which foods are rich in phenylalanine? Soy-rich foods and soy supplements are the best plant sources, and nuts, pumpkin seeds and squash seeds also contain it. Animal proteins containing phenylalanine include eggs, meat, liver, dairy products and seafood. Lower levels of phenylalanine are also present in oats and wheat germ. 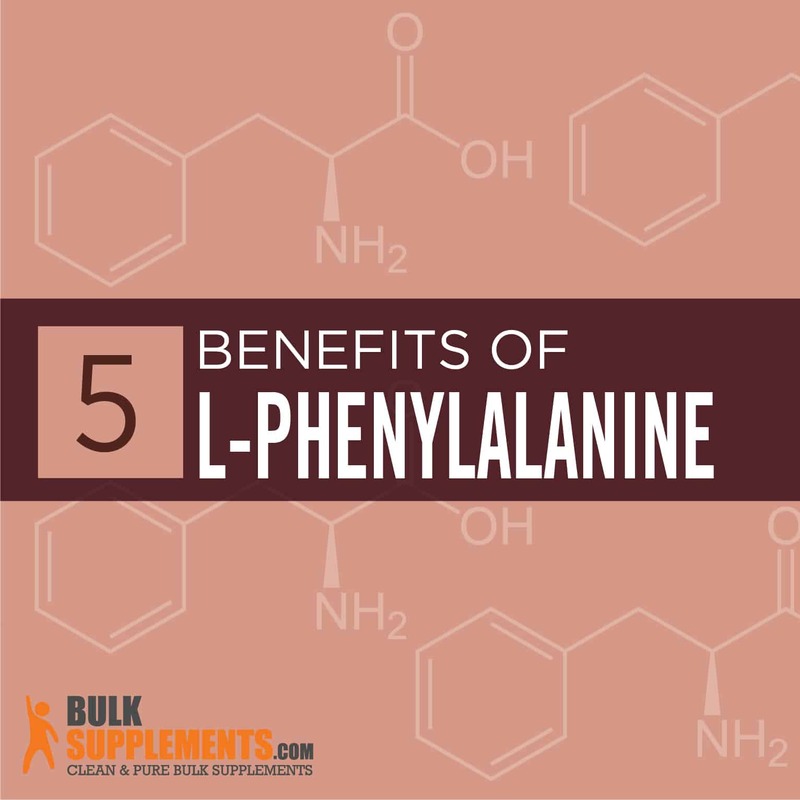 To process phenylalanine, your body requires iron, copper, and vitamins B-3, B-6 and C.
The phenylalanine-dopamine connection happens when phenylalanine is first converted into tyrosine. For a boost of tyrosine, try bananas (especially ripe ones), almonds, apples, watermelon, cherries, meat and eggs (x). The U.S. has set a recommended daily allowance for a combination of phenylalanine and tyrosine. For adults, the recommended daily amount is 33 mg / kg body weight per day. L-phenylalanine powder: As a dietary supplement, take 500 mg (rounded 1/8 tsp) one to three times daily between meals, or as directed by physician. DL-phenylalanine powder: As a dietary supplement, take 375 mg (1/4 tsp) three or four times daily, or as directed by physician. Individual needs vary. Those with PKU should avoid any supplement or product containing phenylalanine. The amino acids phenylalanine and tyrosine appear to aggravate symptoms of Lupus. People with certain conditions should avoid using phenylalanine, including those with schizophrenia or other psychiatric problems. Consult a doctor if you are pregnant, nursing or if you have high blood pressure before taking phenylalanine. L-phenylalanine is an essential amino acid that keeps you mentally and physically healthy, benefiting everything from your mood to the appearance of your skin. It may even serve as a natural alternative to pain medications, making it one of the most versatile and powerful amino acids.